A thermostat such as a model by Honeywell is the key to a comfortable temperature in your home. Models ranging from manual round thermostats to programmable digital models are relatively easy to use and allow you to set up a daily and weekly schedule. The familiar round thermostat is a manual model. On the upper left, there may be a "System" switch, which allows you to set the thermostat on Heat, Cool or Off. It may also have a "Fan" switch that you can set on Auto or On. When the fan is set on Auto, it only operates when the heating or air conditioning is on. When the fan is set to On, it works continuously. To set the thermostat, simply turn the dial clockwise to raise the temperature setting, or counterclockwise to lower the temperature. 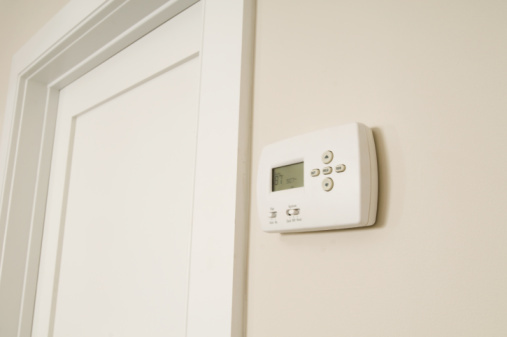 Basic digital thermostats, such as the Honeywell 5000, allow you to set one temperature for heating or cooling. You must manually change the temperature if you prefer a warmer or cooler house. Press any button to back light the screen. Press the "Fan" button to set the fan on Auto or On. Press the "System" button to put the thermostat in Heat, Cool or Off mode. To change the setting, push the button again. The screen will display the setting you've selected. On the right side of the display, the up and down arrow buttons operate the temperature settings. Simply press the up button to set the thermostat at a higher temperature, or the down button to lower the temperature. Programmable thermostats, such as the CT3200, T8011, RTH230B or T8112D allow you to set an automatic seven-day schedule of heating or cooling. By lowering or raising the temperature at night or when you aren't home, you can save on your heating and cooling energy costs. While the buttons may be in different locations on the face of the thermostat, and "Fan" and "System" may be a switch rather than a button, programming the weekly schedule is a similar process. Locate the "Set Clock/Day" button and press it. The time will appear on the display. Press and hold the "Ahead" or "Back" button until the correct time appears. Note if it is AM or PM and continue holding the button down if necessary until the time is correct. Press on the "Set Clock/Day" button. The day of the week will appear on the display. Press "Ahead" or "Back" and hold the button down until you reach the correct day. Press the "Run Program" button once to set the time and date. To change the time only for Daylight Savings or Standard time, program the time and then press on "Run Program." For five days a week, the thermostat gives you four settings: Wake, Leave, Return and Sleep. On the weekend, most models only give you Wake and Sleep settings. Set the thermostat to Heat or Cool before programming the daily or weekend schedule. Press the "Set Schedule" button once. The display will show Wake, Mon-Fri and Set. Use the Time buttons to set the Wake time. Then use the Temp buttons to set the temperature. Press "Set Schedule" to move the programming to Leave. Repeat the process for Leave, Return and Sleep. Press "Set Schedule" until Sat-Sun appears. Set the Wake schedule by using the Time and Temp buttons. Press "Set Schedule" again to set the chosen settings. Lastly, press the "Run Program" button. 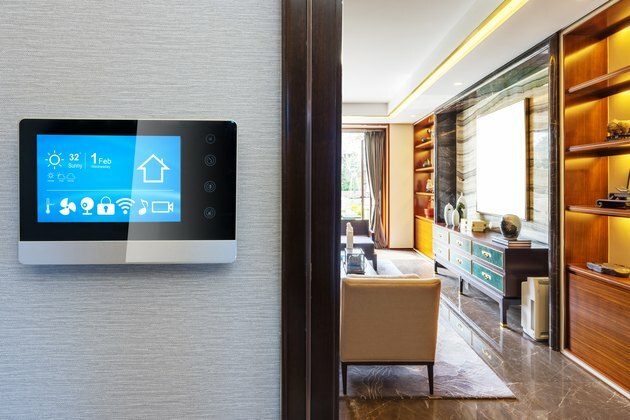 The thermostat will run the program until you change the settings.